This summer, I took a class in World History at a local community college. I am a "mature learner", as my friends who are college instructors would phrase it. Not newly out of high school, in other words. My instructor, Dr. Milenko Karanovich, wanted us to learn a little world geography as part of his course. In his syllabus, he published a list of 100 locations. Countries, regions, cities, and geographic features were listed. Out of this list, he would test us on a selection of twenty-five at the end of the session. We had to place eighteen correctly in order to pass the exam. Dr. Karanovich’s list included such places as the Dardanelles, Sierra Leone, Odessa (without any other locator), Milwaukee, and Bangkok. I followed my instructor’s suggestion and began learning and memorizing locations several times a week. I had an advantage, in that I have gained some geographic knowledge by growing up reading National Geographic magazine. I was always fond of their specialized maps. I did not use the Internet to learn because I don’t trust the Internet wholeheartedly, and because I need a visual context to find my way around a blank world map. I studied with an old National Geographic atlas. Later, because I wished to learn more about Eastern Europe than was on my exam questions, I bought a very inexpensive up-to-date atlas from the college bookstore. A few days before the exam, I met with a couple of classmates to review. To my surprise, they had Googled on all of the locations and learned them that way. This isn’t necessarily wrong at all, mind you. However, Google does not display a picture of a nation surrounded by its neighbors. I would have felt uncomfortable looking all over a world map for a particular irregular polygon. Upon discussion with one of the students regarding one of his locations, I learned that he (one of the Googlers) assumed that most of these places would be located in the United States. The parochialism of that belief astounded me. He had located "Dardanelles" in northern California, because that was one of the choices offered on Google. 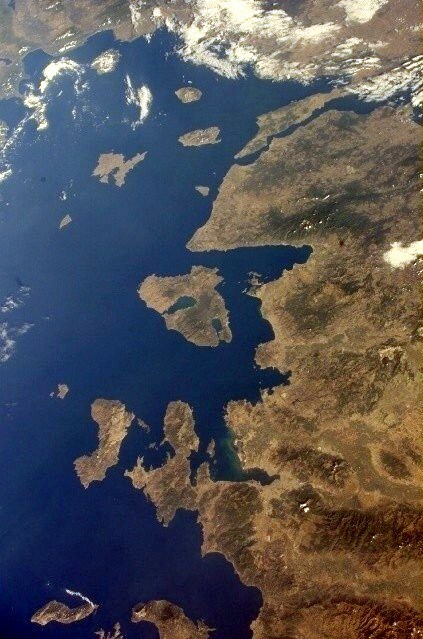 I don’t know where or how I learned that the most significant Dardanelles are the straits located between the Mediterranean and the Black Seas, so I was at a loss to explain, except I knew they were the site of major battles over the centuries. Nevertheless, if a number of locations were scattered all over the globe, wouldn’t that tell a reasoning student that most of the locations were not in the U.S.? After Dr. Karanovich handed back the exams, we discussed the results. He was very disappointed. Many students objected to their getting Odessa wrong because they had placed it in Texas, not Ukraine, which was the correct answer. The Texas one is noteworthy in pop culture for being the site of the nonfiction book Friday Night Lights about high school football, from which derive the film and the television series; whereas the one in Ukraine is a major seaport. Having related that story, I must tell you that the student who sat next to me, who received a perfect score on his exam, had also used Google maps. When my partner and I researched how to use Google to find the Dardanelles, we noticed that Google's top-weighted result indicated their choice for the most prominent or important location in the world as a whole. Perhaps the student with the perfect score chose the first-listed choice alone. He could not analyze his method when I asked him, subsequently. After my class was over, I talked with Dr. Karanovich about this geography exam. To my amazement, I learned that 80% of my classmates failed it. Dr. Karanovich has been requiring his students to learn this material for many years. He deplores the lack of geography instruction in the U.S. today. He claims that most of his students nowadays cannot locate Chicago correctly, and wonders at their lack of knowledge of their own country. Dr. Karanovich has taught throughout the U.S. as well as in Europe, and believes that our high schools are of very poor quality nowadays. Afterward: I am currently taking the second semester of World History with Dr. Karanovich. He will be testing on world geography again. I don't have to take this exam because I received a perfect score the first time; however, I will be able to take it again for five extra credit points. I am planning on doing that. Finally, I was directed to a video of a beauty pageant contestant before I started to write this account. She was Miss Teen South Carolina of 2007. In response to a question about the lack of geographic knowledge in our country, she replied that this is due to the lack of maps in the homes of children today (along with some disjointed thoughts about how we can improve education for South Africans and Asians). Now, libraries and schools have maps. The problem is that no one is teaching children how to use them. By the time they are college age, people should have learned how to read maps as part of their basic skills.